Have you ever wondered how technologies can change our cities? 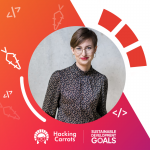 On the 17th of April, we’re coming back to Warsaw to talk about the role of technology in advancing the UN’s Sustainable Development Goals. This time, together with industry experts, we’ll tackle the topic of Smart Cities – 11th Goal of Sustainable Cities and Communities. 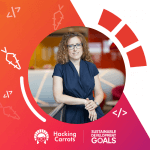 Hacking Carrots brings a new perspective to solving social challenges on a mass scale. We show how programmers, UX and UI designers, product managers or testers can help create a better world. 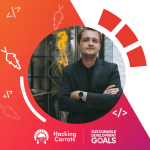 Remember that the meetup is also part of the preparation stage for the first Hacking Carrots hackathon! Together with the Partners of the meeting PwC, Miasto Stołeczne Warszawa, HubHub we can’t wait to meet you! 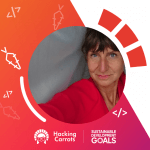 Małgosia is a President of Carrots Foundation. She co-founded a mobile health startup Yagram Health. In 2017 she was rewarded with a title Innovator under 35 by MIT Technology Review for the the mobile app dedicated to mums-to-be. She received his M.A. in Political Sciences from Warsaw University, she studied at Sciences Po Paris and received a French Government fellowship for her second Master at Université Panthéon-Sorbonne. Małgosia is a mother of two wonderful girls Zofia and Julia. Founder & CEO of Bęc Zmiana Foundation. She leads the organization of projects related to public space, architecture, modern art and design. She also created a numer of contensts for young architects and designers. Initiator and publisher of socio-cultural magazine „Notes.na.6.tygodni”. Malina is Business Development Director, Digital Public Sector, PwC Advisory Central & Eastern Europe (CEE). 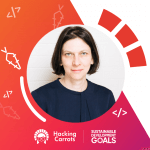 Malina is responsible for developing the transformational projects in the area of digital innovation and cybersecurity for Public Sector customers across CEE region together with technology partners and international financial institutions. Piotr has over 10 years of experience working for large engineering companies and most recently as a solution architect for one of the top 3 CAD system’s vendors – SIEMENS Industry Software . His responsibilities included analysing the needs of his customers and finding and customizing the best solution within the SIEMENS portfolio to address their needs. He worked in many sectors like Automotive , Power Generation , Security and Aerospace & Defence. Since 2015 he is one of the creators of theViewer.co – Design Review Platform in VR. Monika graduated from the Faculty of Architecture at the Poznań University of Technology. She gained professional experience in OMA and Claus en Kaan Architecten in the Netherlands, and in the last four years she worked as a project director at KB Strełka in Moscow. Currently, he is the Director of the City Planning and Development Strategy Office in Warsaw.